As I promised I will be bringing on some wedding preparation posts. Today I am gonna talk a little bit not about the wedding itself but about time before the wedding - engagement. I can say as a women it's pretty important to us. My boyfriend, now fiancee couldn't understand why the ring must look the way I like. There are few reasons, one of them is that we are having this ring for our all life. Of course it's a symbol of love, but it still must match our taste and this who we are. I admit I tried on many rings before I thought how my ideal one should look like. Oh, and first of all I must say I always stay with white gold, since I hate yellow gold. First I was in love with sapphire style. I thought this blue stone is my type. 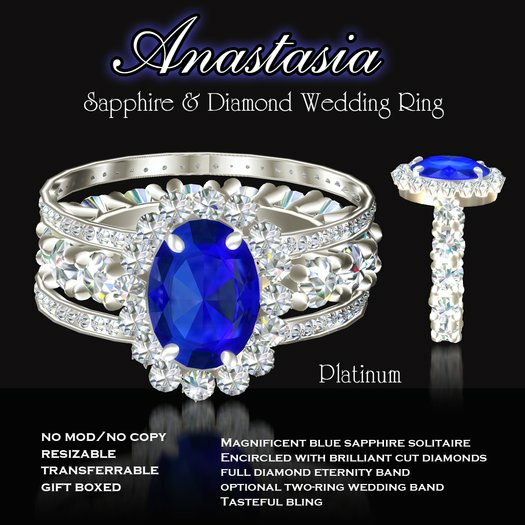 So here I found Exquisite Anastasia Wedding Set Platinum for 799L$, to be honest I don't know this company. But I believe the quality is good. Why didn't I stood with blue sapphire? It's not matching every clothing. 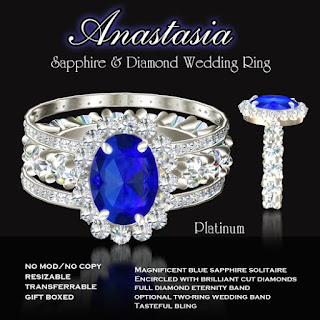 Except that sapphire looks pretty cheap. Lighter is too bright, dark is almost black. I know that Kate Middleton had it and it might be a trend, but I wouldn't go for it. Always while choosing remember it's for your all life. This is so classy!! 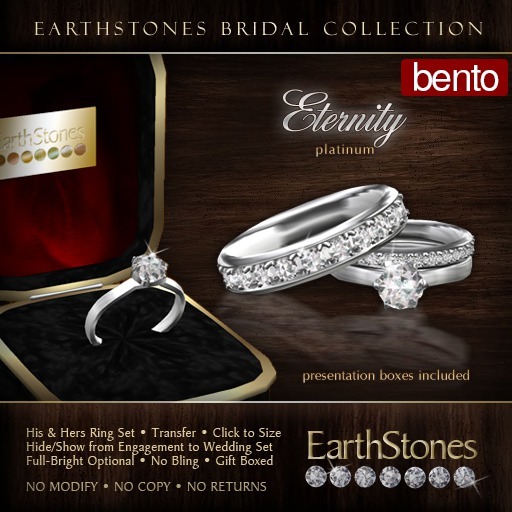 First what I like about brand Earthstones is that they add wedding band that you can turn on/off. 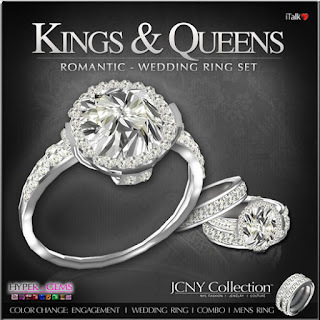 It is great thing, cause you save on buying wedding bands. 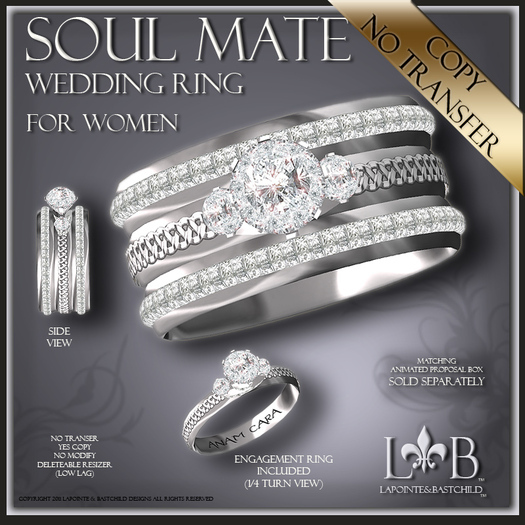 As well in the set you can find wedding band for your man. This is truly classic design EarthStones Bridal - Eternity Wedding Rings - Platinum Engagement Bento first of all they cost 1950L$, so it's not cheap, but still not expensive, since you save on wedding bands. Quality of design is good and you have HUD where you can change the look of your ring and easily switch between metal colors. The most important thing nowadays is bento. This is something important while you are wearing bento mesh hands, as I do. Still classy style wasn't my style, only one diamond? Phew, it's not me. If you don't want to spend tones and still have great quality that's the ring. Wedding Ring "Celtic Soul Mate" Womens Platinum (Engagement Ring, Wedding, Promise, Handfasting) is only for these who don't wear bento mesh hands. Except not including bento option everything else seems fine. What I love about this ring is of course look of the diamond. JCNY is a jewlery seller since I remember. I started my SL long time ago it was around 2007 and they existed then! They were one of the most famous jewlery seller in second life. Now I must admit I don't buy so often in there. The offer is still good. I couldn't anyway choose JCNY - 'Kings & Queens, Hyper-Gems Wedding Rings just because of the size of the ring. The ring comes with wedding bands, and costs 1599 L$, that's not much for good quality and possibility of changes thanks to scripts that are inside the ring. I believe that this might be perfect for people who like to show off with the size of the diamond. 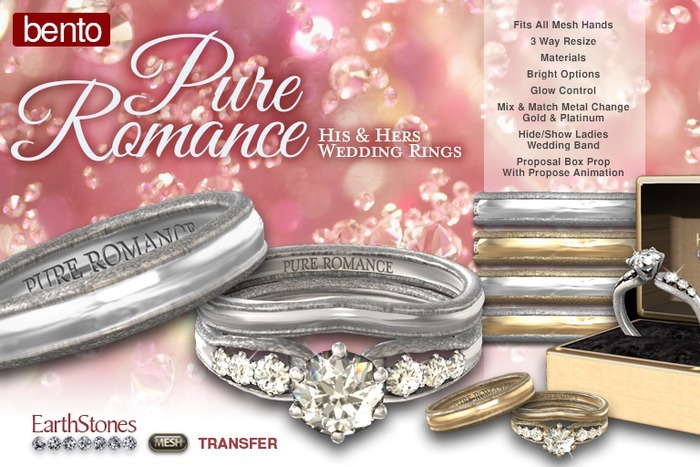 Of course the winner is EarthStones Pure Romance Mesh Wedding Rings Bento for 1899L$. You may be wondering why this one. It looks like my RL one. This ring is perfect, it has right amount of stones, doesn't look boring, and of course is made of high quality materials. I love the way it looks, even more on my avatar than on store advertisement. 2) The ring should match her style, even if it's different than yours try to find something that she might actually like. 3) If you don't know your girlfriends ring style just try to ask her about it in some discreet way. 4) While checking size try to take one of her rings, she would love the surprise while you will propose but also she will have matching ring - really nobody likes to wait additional time when it has to be resized. *Extras* Moving out - break! Here came the day that I am moving out from my house with my boyfriend. I need some times to fix everything. Many new things in my life made me really busy. I will be away from blogging for July 2017, and I will be back on August! I hope you're gonna be back with me. This break means so much to me, and of course I will miss you and miss blogging since it's my favorite hobby ever. Moving away from home makes me really moved, it's my first time so I need to organize everything with all the details!  Of course I may be logging in or updating you with extra things on blog, but with new outfits I will be back from August. As well I hope that you creators will forgive me being away and keep me in your minds, cause for sure I will be back blogging for you soon. Have amazing summer everyone! I guess title says everything! Well after more than four years of being together my boyfriend proposed to me. Of course I said "Yes". I've been waiting for this moment. I am the happiest person in the world. I just had to share it with you! Ring is amazing and perfect. Pure elegance, white gold and diamonds are the girls best friend. But this comment was more likely of a blogger point of view. Getting back to feelings I feel the most loved and happiest person now. I hope in a year I will be able to share my wedding preparations. But of course I will prepare sooner some posts about wedding advices.